I am most grateful to Jay Slater at Fonthill Media for sending me a copy of Brian Scovell’s latest book. I admitted that I knew nothing about football but am glad to say that I am to say that I am much better informed now. I would, though, like to mention that I knew that England did win the World Cup in 1966 and even knew the opposition and score. Brian’s book has not only enlightened but interested me and for that I am thankful. Like many of Brian’s books, it is nicely and enthusiastically written. Okay, as times change, we hark back to what we consider a better and possibly more chivalrous era and, after so many years as a sports journalist, Brian has every right to compare the different eras. I must admit to wondering whether I could flit through the football section, ask a colleague for his advice but found that I immediately enjoyed it. From my experience of Brian’s books, I also chuckled at what I see as some familiar teetotaller Scovell paw-prints. I am not sure whether he frowns upon those who drink but some hardy souls are noted, several demises – not necessarily due to alcohol – are chronicled and, as I have mentioned, the differences in behaviour and standards are all written about. Why not? Having seen so many changes during his journalistic career, Brian is in an ideal position to comment. Above all, The Conquests of 1966 of Alf and Gary is an insightful and enjoyable book. Brian has also been one of the main biographers of West Indian cricketers and so knows many of the good and great cricketers. Poor Charlie Griffith, accused of a dubious action, seems to have suffered during the 1966 West Indian tour of England following the football World Cup. I met Charlie at Swindon at the end of the 1980s or so and found him a most engaging character the bad publicity having presumably been long since forgotten. The reason for Brian’s book is that he, lucky man, was the only national newspaper sports writer to report on both the World Cup and the West Indian tour of England which they won handsomely. His Daily Sketch reports within the book also include featured articles by another West Indian former great, Sir Learie Constantine. Sir Garfield Sobers is very likely one of the greatest and remarkable cricketers. Absurdly talented, his charisma and flair made him stand out in any era. 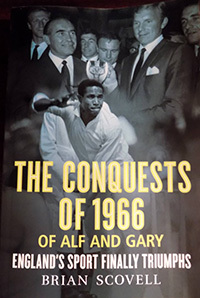 Brian has previously collaborated with Sir Garfield on a previous book but it is nice to read more and about his team mates in this most enjoyable book.